It is New Year 2002, and I am enjoying the solitary freedom of my coastal walks. The family are planning a visit to Ellensbrook House, a WA Pioneers’ Museum, so I get them to drop me off at the north point of Cowaramup Bay (I love these names). I follow the beach, then climb up behind south point, past Gracetown, and along a long inland path with great views of the surf and surfers in several places below. It is not easy finding Ellensbrook House, 7k and two-and-a-half hours later, but after a bit of bundu-bashing (swahili for bush-pushing), I avoid walking right past it. A thunderstorm looms, but luckily blows over. A thankful rest and lunch at this simple historic place, then an amble with the kids to Meekadarabee Cave. The following week, Roy and I visit Cape Leeuwin while the family make camp up the Blackwood river. I walk the uneven rocky path northward for 3k (one hour) to Skippy Rock and see oyster catchers and curlews for the first time. It is a lovely scramble in the cool of the evening. 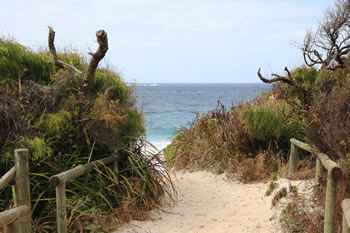 Very different in the heat of the midday sun is the 7k walk the next day from Hamelin Bay to Cosy Corner. It is a spectacular view to Hamelin island from the rocky point, consisting of soft pancake rocks cordoned off for safety.Then a challenging trudge for 1k through soft sand and a laborious two-steps-forward-one-back off the beach to join a faint 4-wheel drive track inland through wild shoulder-high bush full of flies (thank goodness for my Christmas present from Col & Annette: a fly-veil). Heat, maddening undulations and no view until just before the lighthouse where I sit on a bench to munch some lunch. I still manage to swallow two flies.Then down again to meet Roy on the road to Cosy Corner. Heat, sweat, and little breeze. Starting at 4 p.m. this time from Sugarloaf Rock, I walk along a pleasant cliff-top path with great views to the “Three Bears” (popular coves providing varying levels of waves) where I meet a couple of surfers who don’t think much of the day’s waves. Thereafter it is a tedious trudge along an inland 4wd track with brief glimpses of the sea. The going is soft sand throughout and black dirt clings to my feet and legs. Three hours later I arrive in Yallingup, ending with a long trudge along the soft beach to meet the family for fish ‘n chips in the sunset. Afternoon walking is most definitely the answer in the increasing temperatures of the Australian summer. Another most enjoyable evening is a 9k walk along a 4wd cliff-top track from Cape Clairault to Moses Rock with the ocean thundering below. Towards the end, I paddle through Quininup Brook as it trickles down the beach where large waves heap and break in deep basins creating mighty undertows. Then atop the cliffs again I go among bulrush-type banksias in red-soil marshland to the Moses Rock car park. 46ks walked out of a possible 136! This entry was posted in Travels and tagged Cape Leeuwin, Cosy Corner, Cowaramup Bay, Ellensbrook House, Three Bears Coves, Yallingup. Bookmark the permalink.